Crowley has developed REALLY well for you - what training did you have him on? General training Balance, individual training Attacking Midfielder (All Roles) set to heavy. I had him tutored by Rosicky, too. With the editor out, I've had a look at the Arsenal players' PAs. Here are a select few; if you don't want to know, then don't highlight the spoiler tag. Ozil and Welbz play pretty much every game, so in terms of Munir's development it's better if he's covering two positions. He'd be an excellent attacking LB (minus the pace). It's really difficult to find good left backs with high flair and vision, that's why I often retrain attacking midfielders or wingers who have decent defensive stats to full back. Also, thanks to Chambers at RB and Bender at CM, I should have enough defensive cover to compensate for Jack's deficiencies. Also, I really like Jack as a player and just want him starting somewhere tbh. He doesn't fit into my preferred central midfield, as I always prefer having physical central midfielders who are good in the air. 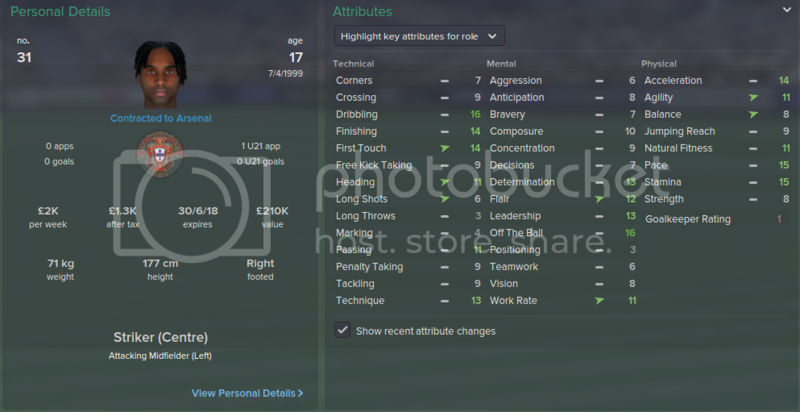 So, I'll either retrain him to LB or play him on the right wing, depending upon whether I sell someone or not. LB all the way! Would be nice to see something as drastic as that. Usually retrain Gibbs as a LM also. Also had a world claass regen once and retrained him at RB just for cover, well forgot to take him off the schedule and before long he was natural there. FA Cup - Winners! Beat Chelsea 2-0 in the final! Trudged my way through pre-season of my second season. I made just the three signings: John Stones (around £16mil from Everton), Patrick Roberts (£9mil from Fulham) and Joe Gomez (£6mil from Charlton), all with the view of replacing a few first team members next season. Stones stays with the squad as fourth choice centre back, while Roberts and Gomez were loaned back to Fulham and Charlton to gain valuable playing time before joining up with the squad next season. On top of a whole bunch of released players and loans, the only major departure was Giroud. I didn't want to let him go due to how clinical he was for me last season, but I did promise I'd negotiate with Bayern should they offer and they did. I managed to get £20mil from them, which isn't bad for a 28 year old striker who wasn't even my first choice last season. This season I'll be trying to play two tactics: a 4-4-1-1 and a 4-3-3. One of my goals this season is to get more out of Ramsey, and I believe the 4-3-3 will help me do that. Spurs are our first league game, and we play Everton, Man Utd, Chelsea and Newcastle all within the first six weeks, so it's a difficult start. I don't know if this'll be useful, but I find not playing anyone with a condition below 92% and subbing off players who's condition drops below 70% where possible leads to less injuries. Also, if anyone picks up a knock it's probably better to get them off the pitch as soon as you can rather then let them play on, as there's a good chance the injury will just get worse. I still get the odd injury but I've never had a major crisis managing the players' fitness this way over the past few editions of the game. Plus this gives my fringe players more game time, so their fitter and readier to step in when need be, which I think is especially important this year as match fitness takes longer to increase. Couldn't agree more dude, this is my mantra every year and it usually works. Pretty happy this season as I won the quadruple. Next season I really need to aim at getting further than the QF of the CL. Not a massive amount of transfer activity for the first team. Malcom came in to replace Giroud as back up striker, and Eder Alvarez Balanta and Shkodran Mustafi both came in to replace the outgoing Nicolas Nkoulou. Oliver was very much a luxury signing as I did not really need him. In hindsight, I probably should have loaned him out as he didn't play much for me. Apart from that, all of the other players that I brought in were youngsters. 3 more losses this season than last season. All bar one were away from home. I am a little concerned about my team not performing away from home, so I may need to create a slightly more conservative tactic to make us more solid. CL: Lost in the QF again - this time vs Man Utd. 3-5 on aggregate. FA Cup: Won! 2-1 in the final vs West Ham. Capital One Cup: Won! 2-1 in the final vs Tottenham. Community shield: Won! 2-2 vs Man Utd, won on penalties. Started a file today, so far just about to play the community shield. I've started a new career with Arsenal and i need an holding midfielder who plays as CM-D in my 4-2-3-1. I'm undecided between Lars Bender (my favorite in FM14 but he is injured) and Sami Khedira (who looks good but the wage is too high , 115k vs 86k for Bender). who buy? Overall a good start. Wilshere, Alexis & Giroud are playing well. Notably have not conceded a goal in 7 games so far. Spuds have just won the league on my save, whats happened to the realism?? Why not look at someone else? Morgan Schneiderlin is another fairly obvious option, but then you have Christoph Kramer or someone such as Sergi Samper to choose from. William Carvalho, too, is another option. There are plenty of good holding midfielders out there. Just starting my second season, had to play a play off to get into the champions league, come to the group stage draw and theres 6 English clubs in the draw, how is this possible?? Well I'm returning to Arsenal for the 2014-15 season after a while since I played any FM and I'm certainly a bit surprised by some of the changes that have been made. For the first time in a few years I'm finding it difficult to get a decent tactic together! Christoph Kramer represents my first mistake. I didn't notice he was on loan so I've spent around £10m on a player I desperately need - particularly having sold Flamini and Coquelin - but won't get until the end of the season. 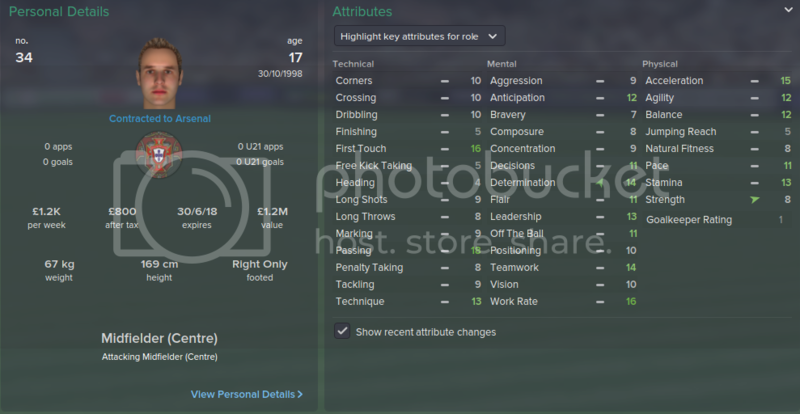 My first idea was to loan Neustadter for a year to fill the void but Schalke won't let him go out on loan. If anyone has any suggestions for a temporary fix to get me through the season then let me know please! Cazorla and Mertesacker are both on the verge of leaving the club. I can't seem to set the rest of the team up to compensate for Mertesacker's lack of pace the way I could in FM14 so his weaknesses seem to be getting exploited rather than being the towering CB who's always in just the right place like I have been used to. I can't quite bring myself to lose the BFG just yet though. Cazorla just isn't quite doing it for me. In the Ozil shaped hole his long shot habit is a problem and out wide I can't get the best contribution from him. I'm having fun with this FM15 brainteaser though. It's taking me a lot more figuring out than past iterations have. Sanchez just broke his leg while away with Chile... Not at all happy! I don't go onto the other forums much. Hence, asking here. In my Arsenal save, I find that my entire team is very, very slow in getting to the ball first. If the opposition striker takes a shot and my keeper saves, more often that not, the opposition are quicker to the rebound and tend to score. This isn't a coincidence as I've conceded atleast 8-9 goals by January in that manner. Any suggestions? Also, having a lot of trouble with conceding goals at the near post. My defenders always seem to lose their man at the near post. Its ridiculous. Infact, most of the goals I've had against me have been a combination of the above two factors. Any tips to stop this would be greatly appreciated. I've noticed the same but I have to say that I've benefited plenty from this too. It's as though attackers from either side are able to better anticipate the ball in the box than defenders. Just started a new game over the weekend now that I have the full edition, got Balanta for GBP 6.5 and Depay for GBP 11.5, very happy with those bits of business...got Khaderia for GBP 18.5 and some squad/back up players. Looking forward to seeing how far we can go! Same here, new fm 2015, new arsenal save for me. I got Balanta and Dedé who both look very good. Also bought Depay and Romero. I've decided to sell Cazorla and got 25 mil for him so that's okay for me. Overall a very good start, except for the community shield match vs man city. Munir - Looks good already but I've put him in the reserves while he settles in. 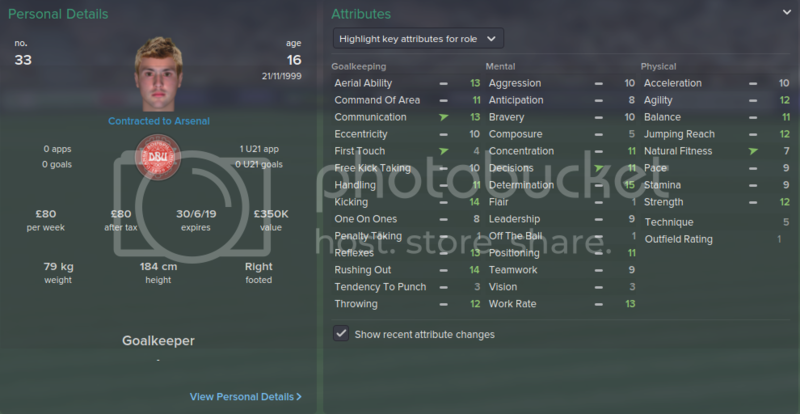 Romero - Started very well, but has dropped off a little during December. Still a huge talent with bags of potential. Strootman - 3 games, 7.10 average rating and is already making a huge difference to ball retention in the middle of the park. Him and Wilshire seem to work. Ajer - Straight into the U21 squad for this season to aid his development. Balanta - Still a little raw but currently has an average rating of 7.48. Nkoulou - Can't recommend this guy enough, he plays CB and DM, is good in the air and strong. £6.5m he cost, bargain. Depay - Still a little inconsistent but when he's on form he's unstoppable. Flamini - Ran around like a headless chicken, sometimes would back off players for no reason, other times he'd fly in at knee height. Rosicky - Would have liked to have kept him but squad space was limited with 5 others who can play AMC, someone had to go. Also, a special mention for Welbeck (23 goals by the start of January) and Arteta. I had a conversation with him in November about reducing his squad status to Back-up, he agreed with it. Since then he's been on fire, 4 goals in 7 appearances (though 2 were penalties). Glad I kept him. I gave into temptation today and bought this on a whim on the home from Uni. Have to have another go with Arsenal, see if I can match my colossal save from FM11. Just got a few questions. How does the 4-2-3-1 play this year? Is it still weak defensively with the LW and RW not tracking back, and the CMs not sitting deep enough to pick up #10s? Is the 4-4-1-1 still the superior version of 4-2-3-1? Good thing with Arsenal this season, they can interchange between these quite well. Furthermore, before I start the save I like to tinker with the editor and adjust some players (criminal, I know :o:o) just would like to get some opinions on who needs a little boost and who is a little overrated? Last year I remember Giroud being unstoppable due to the match engine, not really his attributes, unlike real life where he is not that prolific. Normally, like to pursue through the data issues forum for some players from other teams also. 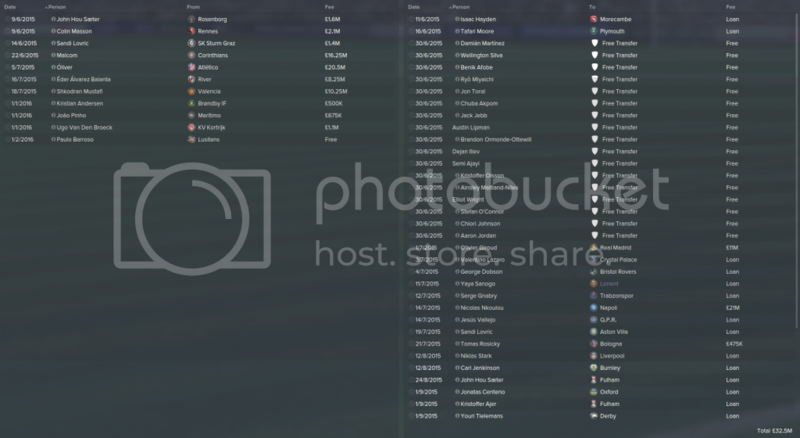 Apart from that, just need to activate certain national teams and I'll begin the save. Welbeck has been absolutely lethal as a CF/a in a 4231 Wide formation for me. 19 goals in 19 starts. My save now a few days before christmas 2014. Haven't been able to use Giroud at all, because - as in rl - he's been out injured, just starting to train again now. Have played FM 15 only a couple of days, but I'd say that it's easier to get a 4231 Wide working properly compared to FM 14. I actually changed from a 4-2-3-1 to a 4-4-1-1 mid-season because I was fed up of my attackers not coming back to defend. I found that putting AMs on Support duty does get them to track back more, but no where enough as they would when playing LM or RM. 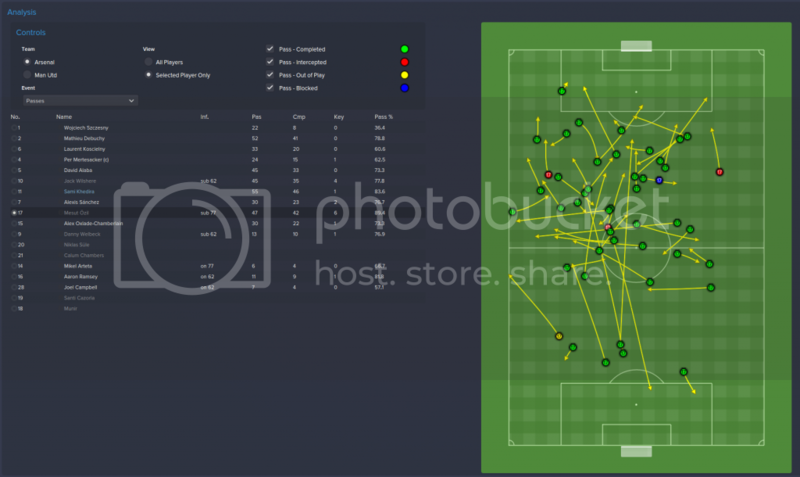 Even as Wingers with attack duty, they track back and help the defence. The only trouble I'm having with it is getting my wide players into goal scoring positions more often. Furthermore, before I start the save I like to tinker with the editor and adjust some players (criminal, I know ) just would like to get some opinions on who needs a little boost and who is a little overrated? Last year I remember Giroud being unstoppable due to the match engine, not really his attributes, unlike real life where he is not that prolific. Normally, like to pursue through the data issues forum for some players from other teams also. Two that stand out to me as being a little underrated are Gibbs and Bellerin. Gibbs still performs fantastically well but is probably a bit better defensively than the game gives him credit for. Other than that, I think everyone has been rated well this year. Nobody really stands out as overrated, other than perhaps Wilshere's mental stats. 1. My fullback was overloaded by 2 players and left helpless to stop the progress down the flank, leading to an easy cross. We all know how those end this year. 2. My CM(d) was drawn across to help out the fullback, leaving an overload situation in the middle and the opposition would exploit that space to crack one in from the edge of the area. The solution I've found is actually a simple one. Using the individual instruction Mark Tighter made my AML/AMR track all the way back. 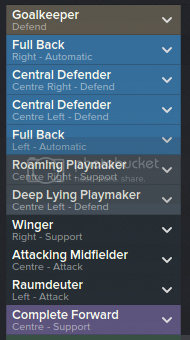 I also added mark tighter to my CM(d) and this made him stick nearer to the opposition AM rather than be tempted to get sucked out wide to close a winger. I experimented using the close down more instruction in conjunction but this actually lessened the effect because sometimes he'd be drawn away to close down other players, leaving the fullback unmarked in advanced positions. I'm currently using this just on my AML and not on my AMR. The result is that Danny and Alexis are staying high up field when the ball is won back, but at the expense of a little more vulnerability down the right. My next challenge is to get the best out of the AMC position. With Ozil there it would seem easy but I just can't get him (or anyone else) to really contribute. I've actually experimented pushing him back to a roaming playmaker in the CM line and it's seems to deliver much more balanced results. He's coming a little deeper and applying a bit of pressure when we're not in possession (even if that's not really his game) but still gets up into the final third and finding pockets of space to dictate passing. So much so I'm toying with the idea of retraining him to become more familiar there instead. Have any of you guys cracked the AMC role before I ruin Ozil? Those two looked fine to me added some speed to Bellerin. Finished touching up a few players ca/pa around the database. For Arsenal, nerfed Giroud ca/pa and some attributes, Ramseys PA dropped a few points, can't believe he was given such a high PA despite that awesome season, higher than Kroos, Modric and Vidal! Shaved a few CA points off Santi and Ozil. Also reduced a couple players PA. All in all, the changes probably won't make that much difference in the long run as its only 1-2 points here and there. End of January and a quiet window for me. Into the final of the Capital One Cup for the third year in a row! Facing Derby who beat Chelsea 3-1 away and drew 3-3 at home FA cup has me drawn against in the 4th round and I have been drawn against Barcelona in the first KO round of the Champions League And once again Chelsea are the pace setters in the league with 58 points after 23 games, I sit in 4th with 50 points with Man Utd and City in 2nd and 3rd. Ozil doesn't always perform for me either. I tried treqartista but I'm going back to advanced playmaker now. Actually Juan Fernando Quintero does better for me there. Alexis has been very bad for me. Gonna try inside forward for him now. For me, Özil is AP/s, Alexis is roamdaughter (or whatever) on the right, Chamberlain is IF/s on the left, behind Welbeck as CF/a. CM/d and CM/s in the middle. Control/Very Fluid. Works very well indeed. 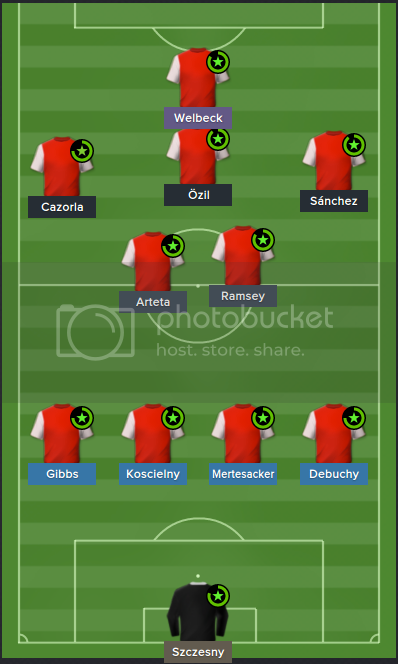 Thanks for the great help and inspiration to create a proper Arsenal team! A bit off topic, but Munir looks like a vampire on the pitch. Pale as f**k.
I see that most people are using 4 at the back, I've been a bit different and I'm trying to stick with my 3CB's and 3CM's, seems to be getting me some decent enough results, but saying that I've only played 4 competetive games! What's the best place to upload photos to and once I'm home I'll put a picture of my tactics up! Got offered £23m for Gibbs at start of second season by Liverpool, which I thought was too good to resist. Anyone bought in any quality LBs? 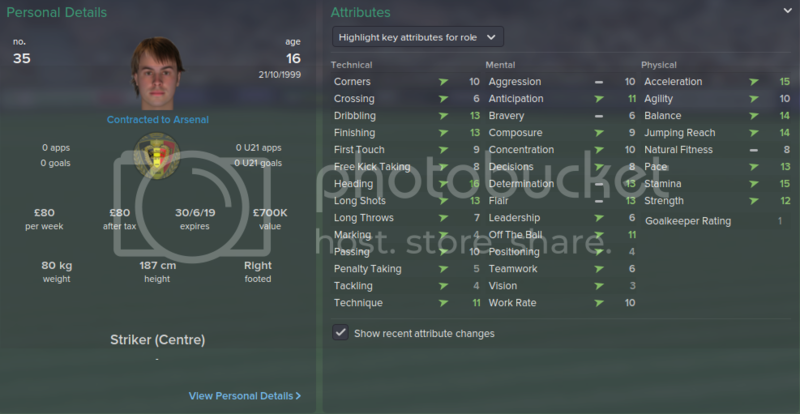 I'm taking a look at Jonathan Silva at Sporting but not certain I'll go through with it. Decent full backs are incredibly difficult to find on this game, do you want someone to come right into your first team and replace Gibbs, or are you willing to have someone who has alot of room to grow? I would go for alex sandro of porto and if you want to splash the cash, alaba is also good. Bayern have 2 great left backs. Alaba is obvious as mentioned above, but Juan Bernat looks a real class player too. Edit: to Gholliday, mucked up the quote buttons. Thanks for suggestions. You had a look at Fábio Coentrão? Having a look at left backs now, Kongolo, Bernat, Jose Luis gaya, Andrew Robertson. I just wanted to share a game a couple of screenshots that demonstrate Mesut Ozil deployed deeper as a roaming playmaker as I had discussed earlier. This is the first game of the PL 14/15 season and we're at home against Man United. I've sent my team out with an attacking mentality but I wanted to make sure that my midfield was contributing all over the pitch against the compact 4-3-1-2 that United seem to be rolling with this year so I dropped Ozil back from his natural AMC position into central midfield. To his right was Wilshere playing CM(s) and behind Khedira playing DM(d). I'm seriously delighted by the way he played. At one point he followed Van Persie all the way to the corner flag before getting the tackle in, which can be seen as the bottom right tackle above. That was from open play too, not a corner or free kick! A massive shoutout needs to go to Khedira, who made 6/6 tackles, 10 interceptions, won 6/6 aerial challenges, scored 1 and assisted 1. All in all it was a great 3-0 home win to kick the season off with! That's pretty good, I don't think I'm alone in saying I'm struggling to get the best out of Ozil this year! On the beta I went as far as to have a formation with no AMC and left him as a benchwarmer!